Profesionální projektory Barco vynikají vysokým rozlišením a vysokým výkonem. Přístroje jsou určené především pro graficky náročné aplikace, jako jsou vizualizace pro vědecké účely, simulace pohybu, zobrazování pro lékařské účely či projekce ve veřejných prostorách. Výrobce klade důraz na kvalitu obrazu a spolehlivost. Všechny profesionální projektory jsou k dispozici pro nepřetržitý provoz a mají širokou škálu možností konfigurace pro různé aplikace. Night time. Enemies closing in on you. Limited visibility. Training for critical situations in real life can be difficult, dangerous and costly, especially at night time. Therefore, training in simulated environments that are so life-like that you think they are real is highly critical to maintain the highest level of combat readiness. The new FS33 IR, Full Spectrum LED DLP® projector, adds specific features and functionality for NVG stimulation, with optics purpose designed for IR transmission. Thanks to its 0-100% adjustable RGB visual, you gain a deeper black level for a simulation that is truly lifelike. Furthermore, utilizing our 2nd generation solid-state LED illumination, it is 50% brighter than our FL32 series, promising years of maintenance free simultaneous IR and RGB display. Unlike the competition, it features a wide range of ultra-high quality projection lenses, a choice of two native resolutions (1920 x 1200 or 1080p), and enhanced control features. With no lamps, our 2nd generation patented ReaLED™ IR and RGB LED illumination engine provides up to 100,000 hours of life time expectancy. No re-calibration requirements, no color degradation and no foreseeable maintenance. You have a perfect projector for all visible video and NVG IR stimulation requirements. With its unique 4-LED engine, it can accurately project day and night imagery simultaneously. No lamp means the FS33 IR can be placed in any orientation angle thinkable. With its comprehensive, and very high quality projection lens options, and industry standard mounting, it further greatly simplifies installations by keeping infrastructure cost down. There is only one cabinet, complete with optics, I/O, processing, and control. Complete system weight is only 16 kg (35 lbs.) with lens mounted. 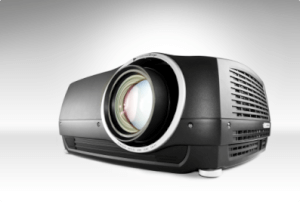 The total makes up a projector that is rugged enough to be integrated onto motion platforms or in simple truss systems in any orientation angle. Our unique frame rate processing and integrated adjustable SRP™ Smear Reduction Processing creates smooth and fluid imagery, perfect for all types of fast moving images, from fixed wing fast jet, through rotary wing, gunnery training, and a ship’s bridge tactical training.